Over the last month, we have added two new features to help promote your participation in Maven and secure more consultations. These features, along with the ability to activate a Maven Public Profile, are a powerful way for you to build your Maven network and find more consulting opportunities. When someone clicks on your button they will see your Maven profile and be able to ask you to connect (you can still decide whether to accept or reject the connection request). You can find out details on how to get your button here. The “Consult with Me” widget we introduced last week is a great way for you to promote yourself as a Maven expert and generate more consulting requests. Here’s an example from one of our Mavens, Ewan MacLeod. Ewan is a mobile industry expert in the UK, and he has included his Consult with Me button on his website, Mobile Industry Review. 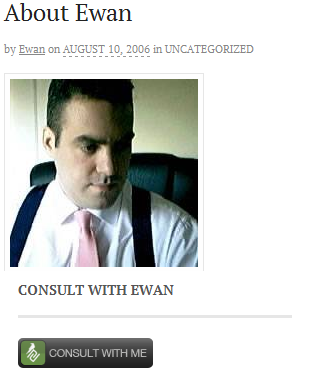 Anyone who wishes to consult with Ewan can click directly over to his Maven profile and request a consultation! As we’ve said before, why give away your insights for free when you can make money from them via Maven? When someone asks you to share your knowledge, ask them to schedule a paid consultation with you through Maven. Click here for step-by-step instructions on how to set this up. Use all three features to get the most from Maven.